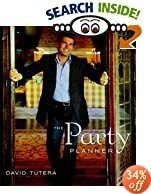 In The Party Planner, David Tutera shares his event and party planning expertise on paper as well as he does on his Disney Channel television show The Party Planner with David Tutera. This book reads like Tutera is sitting in your living room talking to you about your next event. He becomes that involved. You can almost hear him explaining that each of the five senses he brings into play are necessary to make your party work. He talks about the look, the scent, the touch, the taste and the music. Each component is important and relative to the other. For instance for a dinner party he calls Ya-Ya Sisterhood, a beautiful outdoor garden party is planned with pale colors, lots of flowers and delicate china. I admit that this touches my southern girl heart. Among the music he suggests is Bette Midler's "Miss Otis Regrets". Tutera's attention to small details can make any party special; he bought wind chimes for the garden. Several of the party ideas are a bit lavish for modest pockets but most of his ideas can be reasonably adapted. You will find that you don't always find a 'how-to' after an idea or tip has been given. However, that's not a real problem because the photographs by Charles and Jennifer Maring, are not only beautiful they also give you guidance. David Tutera appears on ABC's The View as contributing entertaining expert. His clients include Star Jones and Elton John. However, if you have a question concerning your next party you can talk to Tutera online in the The Party Planner forum on the Discovery Channel.